The previous incarnation of the South Asia section of the Sir Joseph E Hotung Gallery for China and South Asia was broadly thematic in its approach. With a general focus on the religions of South Asia, there was comparatively little space dedicated to the trading contacts this region had across the Indian Ocean over millennia. With the new ‘chronothematic’ approach the gallery is chronological in its overall scope with various themes picked out in the different sections. In this arrangement of the material, there was an opportunity to display South Asia’s regional and global connections and contextualise these moments in its wider history. Indo-Roman trade was one of the new subjects that I was particularly keen to introduce to the gallery. Here, I will give an overview of how I approached curating the Indo-Roman section. Based entirely on my anecdata, it seems to be quite a popular section of the gallery. I often wander down to see how people engage with the displays. I see visitors enter gallery, stop at the Shiva nataraja which announces the entrance to the South Asia section, and then look around, deciding where to go next. 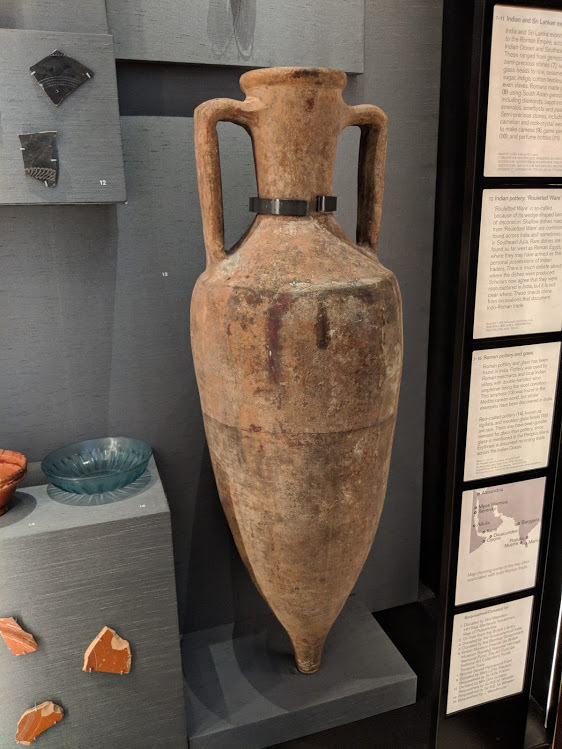 It is when they spot the large amphora in the corner of Bay 2 that they stop in their tracks and walk over to this part of the display. The 1st – 3rd centuries AD saw a burgeoning of trade between Rome and the Indian subcontinent. Sailors harnessed the monsoon winds to sail from ports on the Red Sea coast of Roman Egypt to multiple entrepôts along the western and southern coasts of India as well as Sri Lanka. Merchants carried a plethora of goods and enslaved people between the ports of trade which are described in the Periplus Maris Erythrae, a trading document written in Greek which dates to the late 1st century AD. So, how to condense this complex, inter-regional story that covers many centuries in a single, historic case, while connecting it to the stories around it and, importantly, making it interesting and accessible to our audiences? It was an exciting challenge. 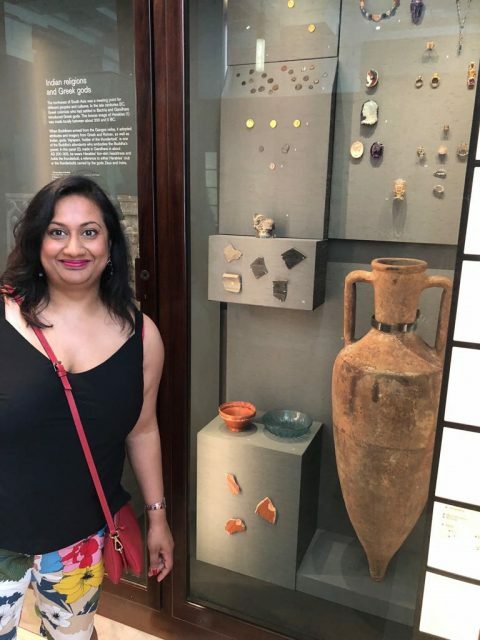 The wide-ranging collections at the British Museum meant that the story could be told through a variety of objects found in the Mediterranean World that were made from materials that originated in the subcontinent, and vice versa. 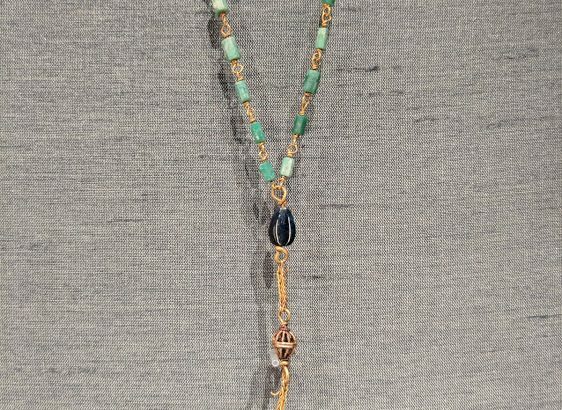 These objects comprise three main groups: coins, objects made from precious and semi-precious stones, glassware and pottery. 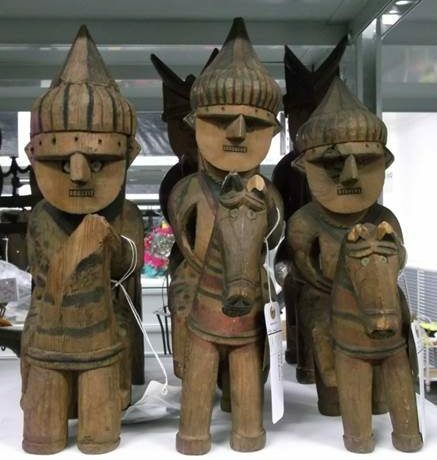 There were aspects of the trade that were more difficult to show for conservation reasons: organic material such as foodstuffs (including rice, sesame oil and cane sugar exported from India), cotton textiles, perfumes and medicines. However, the containers for such goods could be displayed. It was also challenging to show the people involved in the trade, including merchants and sailors, and the many enslaved people who were transported across the Indian Ocean, which made the information in the labels particularly important. 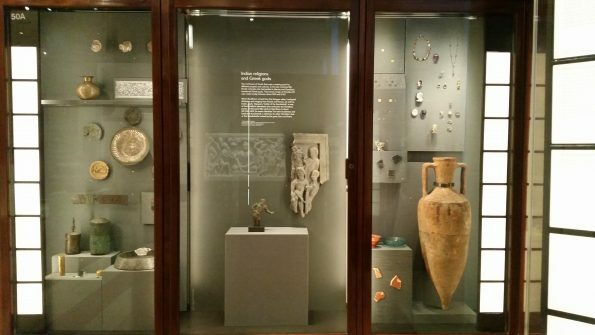 The Indo-Roman trade display is on the right-hand side of the case. The labels look blank in this photo, but I assure you they have text on them! 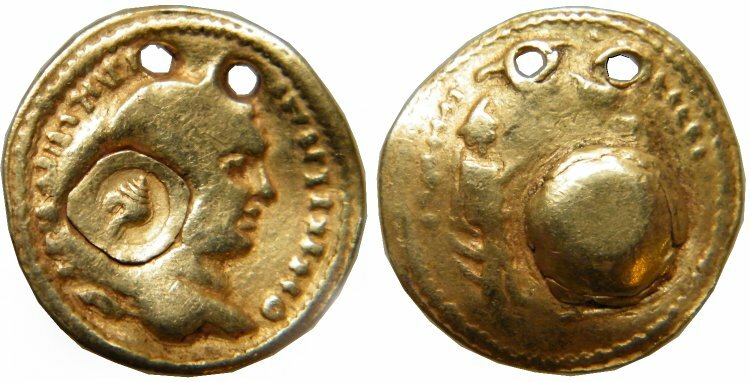 The presence of tens of thousands of Roman coins across South Asia is testament to the scale of the trade between India, Sri Lanka and the Roman world and, as such, they are integral to any display on Indo-Roman trade. Equally, coins from regional powers in the subcontinent tell a compelling story about their active involvement in the trade. 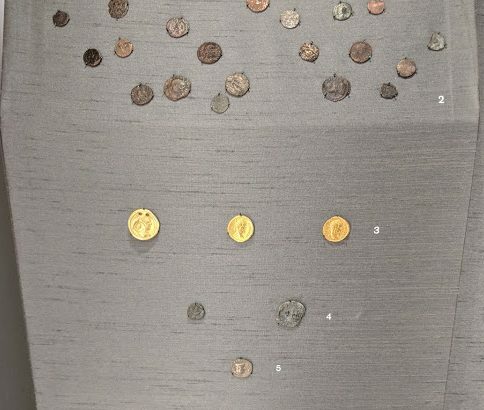 Roman coins are found as large hoards, including near rivers running inland, or single finds in various contexts such as Buddhist reliquary deposits in Gandhara (some are displayed in Bay 2). The gold and silver coins were most likely shipped from the Mediterranean to India to serve as bullion for the lucrative trade. As seen in the examples on display, many of these coins are slashed across the portrait or punch-marked, which suggests they were locally tested for purity before being accepted as bullion. 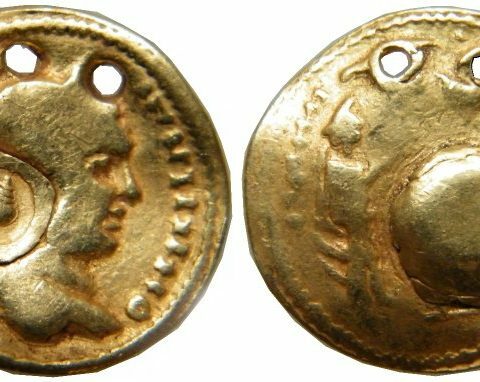 The purpose of the bronze coins is less clear: they were either valued for their metal content or, as scholars such as S. Moorhead suggest, they may have circulated alongside local currency in India. 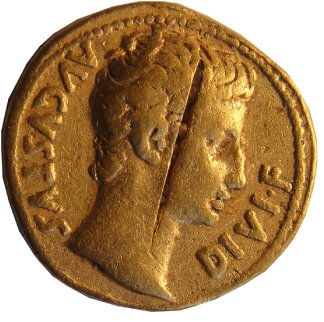 Imitations of Roman coins were made locally, but their purpose remains unclear. Some imitation and authentic coins are pierced and were perhaps used as jewellery. 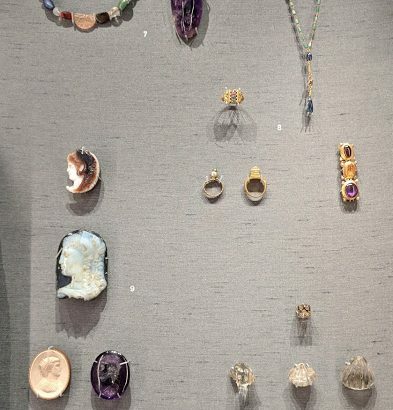 There is one particularly beautiful example of a local imitation gold coin with a conch shell punch mark and as soon as I saw it, I knew I had to include it in the display. The Satavahana dynasty (about 150 BC – AD 250) were key players in the trade across the Indian Ocean. Satavahana rulers controlled some of the largest and wealthiest south Indian ports specifically involved with Indo-Roman trade. I was intrigued to find that they depicted two-masted sea-going ships on some of their lead coins and I selected two of the best examples at the Museum for display here. It was a helpful way to show the way in which the other goods shown in the case were transported across the Ocean. It is such a shame that coins are, by their very nature, so small. It is not easy to see the details on them unless you peer very closely, and this is especially true when the coins are slightly worn, like the Satavahana coins, and the light sweeping across them can’t quite pick up all of the intricate design. 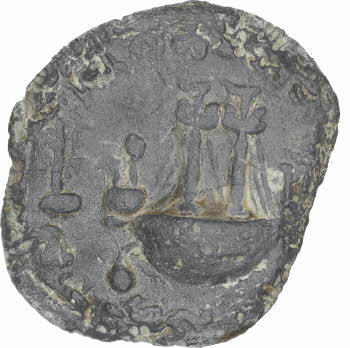 A note: in the previous gallery, a model of a ship coin was on display. Now, the original lead coins are on display. The last coin in this case was minted by the Western Kshatrapa ruler Nahapana (about AD 50). I was keen to include one of his coins because Nahapana may be ‘Manbanos’ mentioned in the Periplus Maris Erythraei. The Periplus is an extraordinary survival: it is a trading document written in Greek in about AD 70, which describes many of the ports involved in the extensive trade around the Indian Ocean, from Egypt to East Africa, Arabia, India and elsewhere, and the goods bought and sold by merchants in these places. Occasionally, rulers such as ‘Manbanos’ were also mentioned. Nahapana controlled the port of Barygaza (now Bharuch at the mouth of the River Narmada in Gujarat) until his defeat by the Satavahanas. 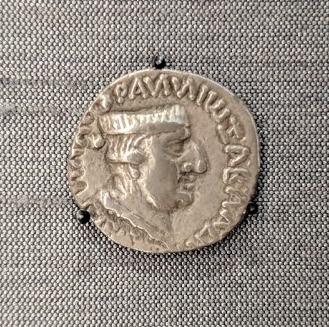 Intriguingly, some scholars have suggested that some of his silver coins might have been minted using Roman coins. A note on the display. These coins were arranged and pinned by Amanda, who has years of experience working with coins, medals, banknotes, badges and more. 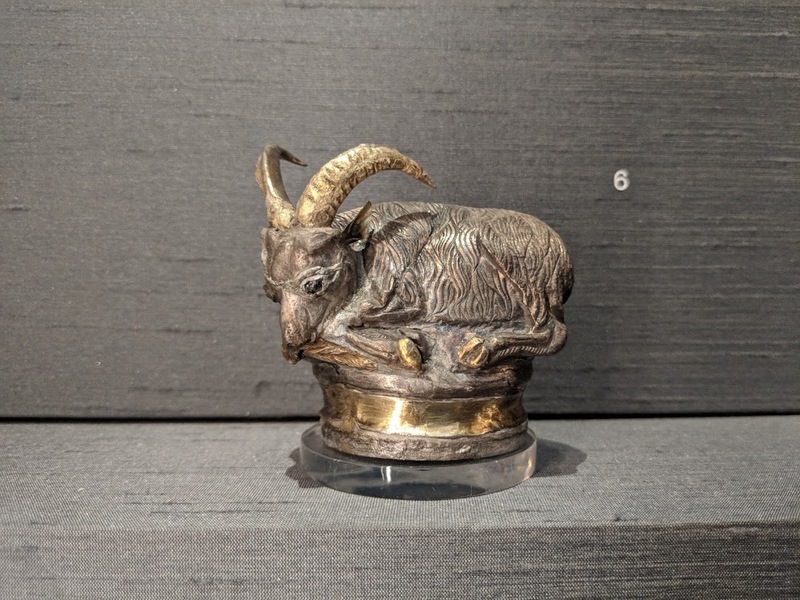 It can be tricky to display such small objects, but Amanda’s organisation of the material is dynamic: it draws your eye from the top left of the case, across the scatter of bronze coins (emulating the way they might have been found on a dried-up river bed), and down to the ibex-shaped pepper-pot. Ingenious! Two of the great privileges of working at the British Museum are my fantastic colleagues and access to some of the world’s most spectacular and wide-ranging collections. I was fortunate enough to draw on both while working on this case. In this section, I wanted to surprise people by showing them objects they hadn’t expected to encounter in a gallery dedicated to the history and culture of South Asia. I also wanted to draw their attention to this corner section of the Bay which is filled with captivating sculpture, a plethora of important early Buddhist objects and, a particular highlight, a fragment of an Asokan Pillar Edict. 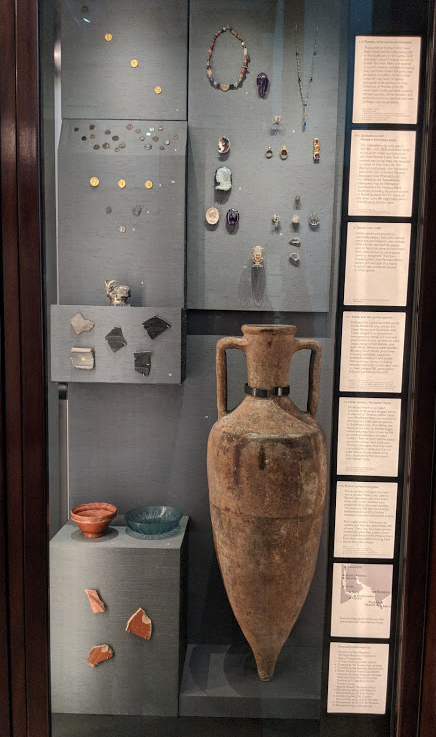 One way I did this was to include a full-sized amphora, and the other was by displaying a dazzling array of Roman jewellery, game pieces and cameos, as well as a gilded silver spice-pot from the Hoxne Hoard. My colleagues Thorsten Opper and Richard Hobbs who curate these collections generously shared their knowledge and the objects they care for. I visited the Dept. 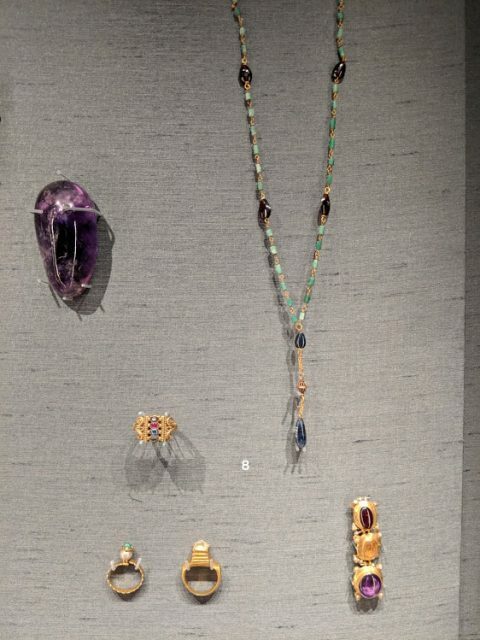 of Greece and Rome’s storeroom and had the opportunity to select a range of beautiful Roman jewellery made from a rainbow of glittering South Asian gemstones, including diamonds, sapphires and amethysts, as well as pearls. 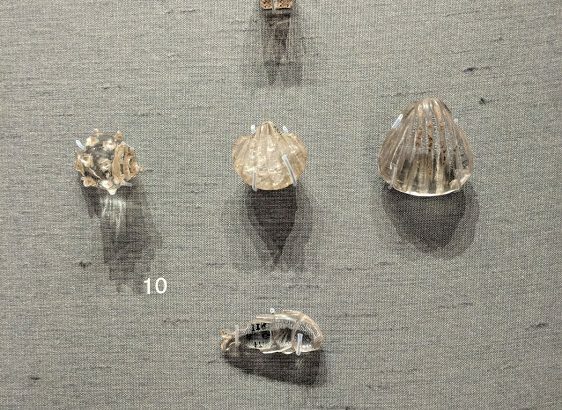 There were also quite a few objects made from rock crystal, but the game pieces stood out: they were carved in the shape of shells and fish which recalled the sea journey so many of the objects in the case had undertaken across the Indian Ocean. 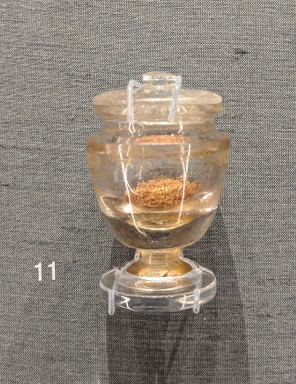 While I wasn’t able to display plant-stuffs or perfumes that were imported from India, I could refer to them by showing a small, carved rock crystal lidded vase may have been used to store perfume or other precious unguents from India. 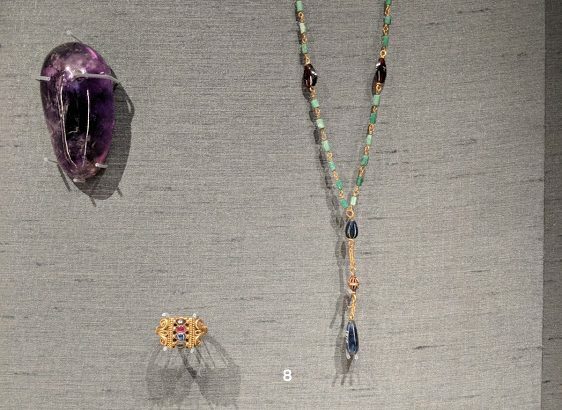 Semi-precious stones were an integral part of the trade. 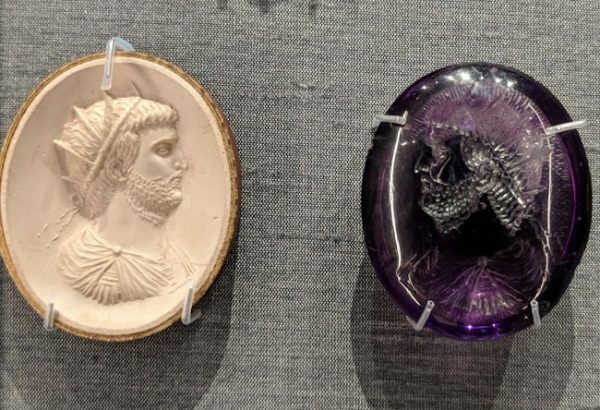 Alongside a necklace of semi-precious beads from northwest India and a sample of amethyst from Sri Lanka, I also included 2 cameos, both of which depicted Herakles, and displayed them side-by-side. It’s an important juxtaposition, but one I didn’t have enough space in the label to explain. Western India was an important source for materials such as sardonyx and onyx which were used to carve Roman cameos. So, when you see a Roman cameo, think: India! 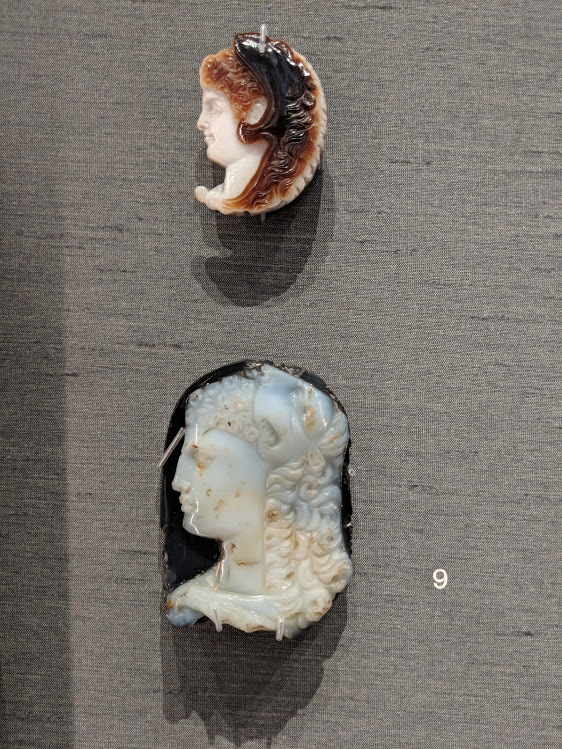 The sardonyx cameo was found in the Mediterranean region, while the onyx cameo was discovered in Akra, Pakistan. 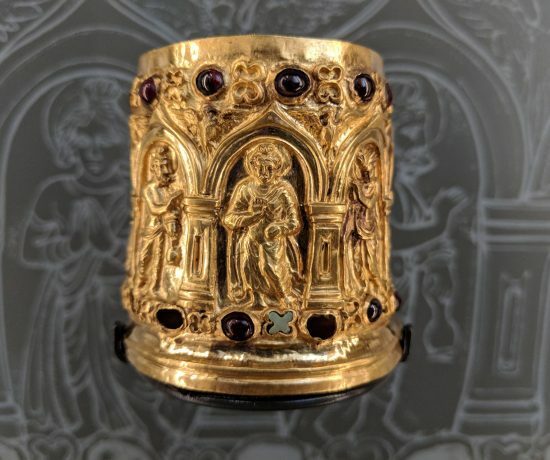 A variety of Roman luxury goods have been found in northwest South Asia, not only cameos but also coloured glass beakers and, of course, gold Roman coins found in Buddhist reliquary deposits. So, the trade in high value finished goods and commodities was by no means entirely one-sided (i.e. from India to Rome), but went in the other direction as well. The reach, extent and complexity of the East-West trading links were astonishing and visitors, especially those from the UK, may not have realised that they extended all the way to Roman Britain and influenced local manufactures and dining habits. The spice pot, which is often referred to as a pepper-pot, is an excellent example of this phenomenon. 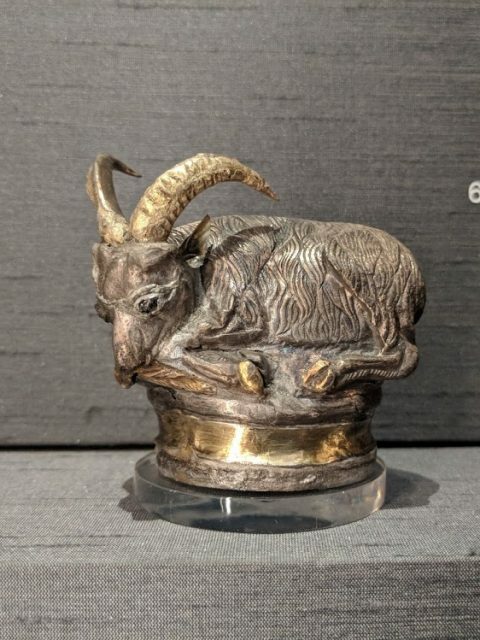 It is a Romano-British gilded silver container made in the shape of an ibex, an exotic creature for Britain, and it still has fragments of the spice-dispensing mechanism in the base. 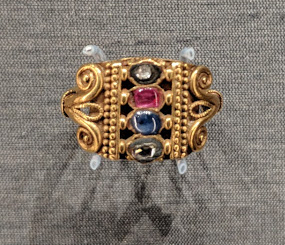 It was discovered as part of a hoard in Hoxne, Suffolk. Without the trade in spices from the east, including pepper, cinnamon and other spices from India and Sri Lanka, this specific object may never have been made. 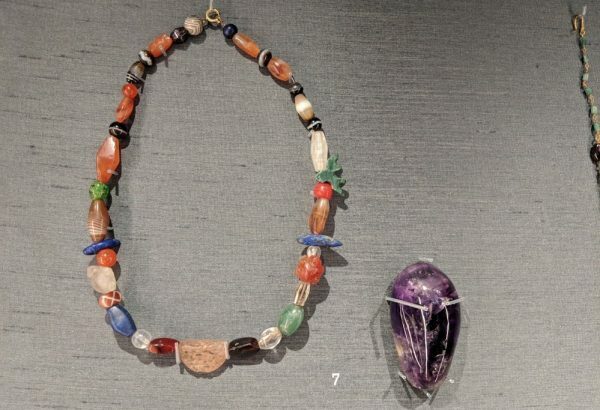 So, as with the gemstones and semi-precious stones used to make Roman jewellery and cameos, South Asian spices had an influence on the material culture of Romano-Britain. 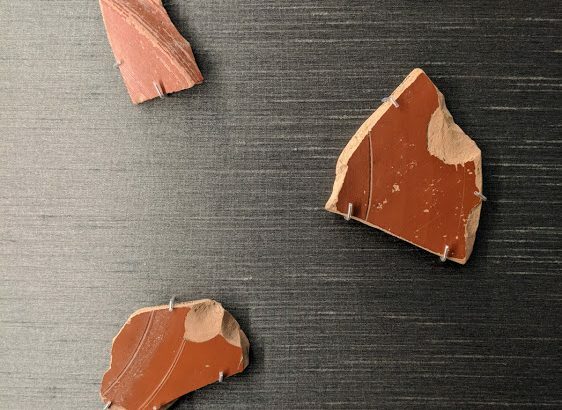 One of the most famous ancient trading ports known to have some links with Indo-Roman trade is Arikamedu, near Pondicherry (Puducherry) and we are fortunate to have a selection of Indian and Roman pot sherds from this site. In this section, I have also included a beautiful Roman ribbed glass bowl and terra sigillata dish, as well as the eye-catching amphora. 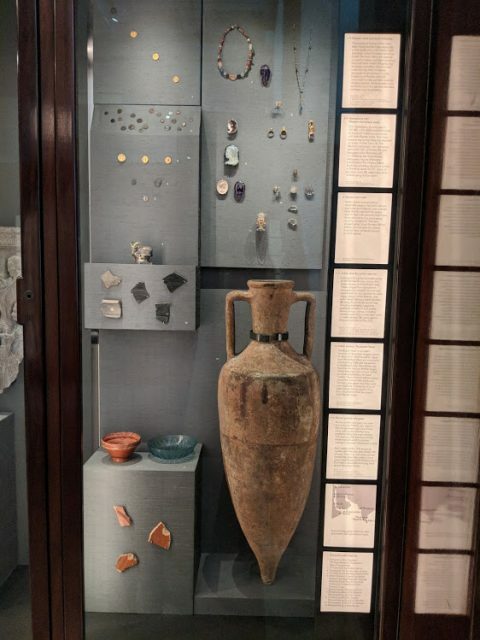 These pottery and glass objects are not, perhaps, as dazzling to look at compared with the jewellery, coins and pepper pot displayed above. However, they are placed prominently because they are an important part of the story of Indian trading relations not only within the subcontinent, but also east and west across the Indian Ocean, and the tell a more personal story about people. While working on this section, Roberta Tomber kindly shared her considerable expertise – and enthusiasm for pot sherds! – with me, and her knowledge infuses this part of the display. My Archaeological Mission to India and Pakistan (1976), p.39. Roman pottery and glass, the physical remnants of Indo-Roman trade, have long been found in India and this particular amphora had been discovered by A. Aiyappan, the Superintendant of the Madras Museum, and his team who were carrying out excavations near Pondicherry (Puducherry). Wheeler began excavating the site of Arikamedu in 1945 and lots more Roman pottery was found, including terra sigillata (red-coated pottery) and ‘Rouletted Ware’ (which he named). More than 40 years later, V. Begley’s excavations at the site provided more insight into duration and extent of trading contacts at Arikamedu, and revealed that the port had been in existence for centuries before and after the high point of trade with Rome. 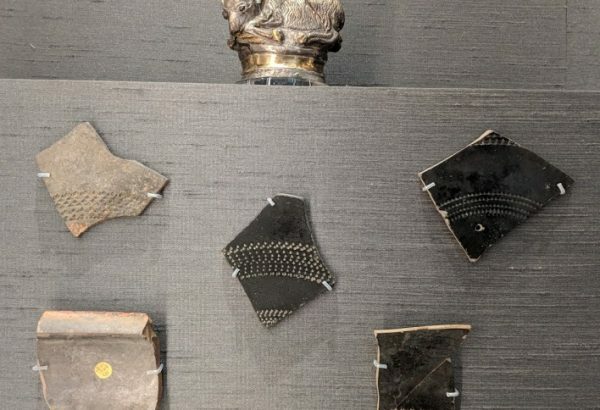 We are fortunate to have sherds of terra sigillata and ‘Rouletted Ware’ from Arikamedu, including some bequeathed by Wheeler himself, and a selection are on display in the gallery. During a workshop focusing on Indo-Roman trade in Pondicherry, I was lucky enough to visit Arikamedu with Roberta and colleagues from the University of Pondicherry and the Kerala Council for Historical Research. 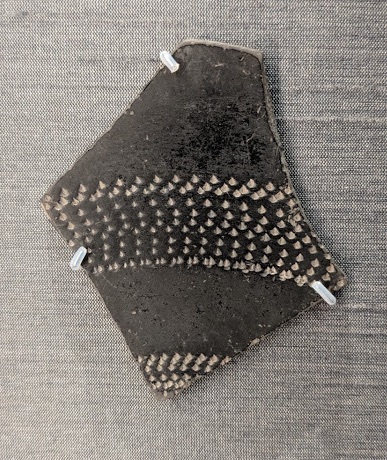 ‘Rouletted Ware’ from the subcontinent is so-called because of its wedge-shaped bands of decoration and if you look closely at the sherds you will see this decoration across the face of the otherwise smooth, black surface. Shallow dishes made from ‘Rouletted Ware’ are commonly found across India and sometimes in Southeast Asia. Rare dishes are found as far west as Roman Egypt, where they may have arrived as the personal possessions of Indian traders. There is much debate about where the dishes were produced. Scholars now agree that they were manufactured in India, but it is not clear where. While the various sherds were found at Indian sites connected with Indo-Roman trade, the 3 complete objects on display were not: I included the red slipped dish, blue ribbed glass bowl and the amphora so that visitors could see examples of the types of objects which were imported into India. I chose the dish because it had the stamp of the workshop in Arezzo where it was made at its centre. I was especially drawn to the clear blue colour of the glass bowl and included it instead of another, equally beautiful, green example because, for me, it evoked the colour of the glittering sea across which it would have travelled. These different types of pottery were used by Roman merchants and local Indian elites, with double-handled wine amphorae being the most common. 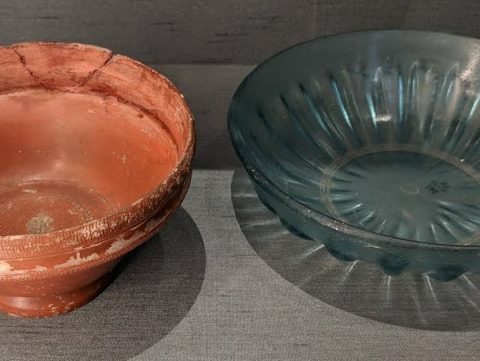 It is quite rare to find sigillata and moulded glass bowls in an Indian context. Interestingly, there may have been greater demand for glass than pottery, since glass is mentioned in the Periplus. And we end with the largest, most eye-catching object in the case and a key component of the trade: an amphora. Amphorae are found the length and breadth of the Mediterranean and beyond into India. Thousands of Dressel 2-4 type amphorae carried products such as wine and olive oil from Rome for the South Asian market and numerous sherds are found scattered in the earth of the subcontinent, silent mementoes of this once vibrant trade. Standing next to the Indo-Roman trade display! This is by no means an exhaustive account of my approach to and execution of this section, but it does give an insight into some of my selections for the display and the organisation of the material. Overall, I’m pleased with the outcome of the display on Indo-Roman trade. I had been worried that the section would be jarring and not fit into the overall narrative in this Bay, but thankfully the section works well in and of itself, while linking nicely with the adjacent sections. The case to the right of the display (in front of the window) contains a spectacular carved limestone figure of a yakshi from a stupa railing. Weapons emanate from her hair while she holds a cluster of lotuses in her right hand. The sculpture is possibly from the Buddhist stupa at Goli, Andhra Pradesh, and dates to the first or second century AD. During this period, this region was under Satavahana authority, including Satakarni the ruler who issued coins depicting ships such as the ones on display in the Indo-Roman trade section. To the left of the display is a gateway panel with two objects: a bronze sculpture of Herakles found in Afghanistan and a stone panel depicting Vajrapani which was made in Gandhara. 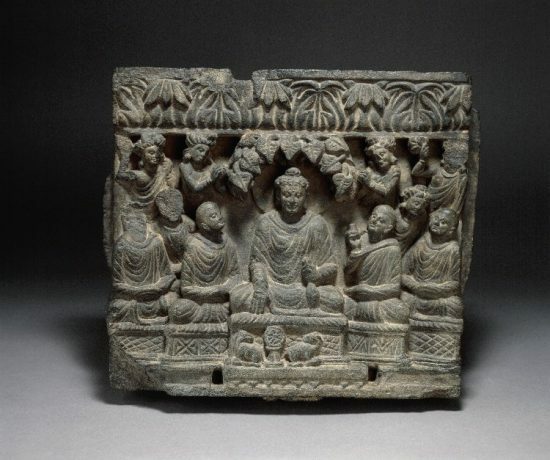 The theme is cross-cultural influences on Buddhist iconography in northwest South Asia during the early centuries AD. The movement and regional assimilation of objects, ideas and imagery, as well as the date, further the develop the ideas displayed in the preceding section. If there is one thing I could add, it would be small mounds of spices next to the spice pot.